“How”, people frequently ask, ” can you continue, year after year, to be so inspired in your teaching?” “Perhaps because we use the methods we teach, and more”, one may answer. The energy and the training of the awareness we gain from our Sadhana provides us with a new experience every time we sit down to teach – in that way, teaching never becomes an empty or formal routine. Our experience as full-time teachers, our common meditations and the constant education at our school, gives us thoroughness combined with spiritual strength. If you do not want to risk diluting the yoga to a series of insignificant exercises with no real effect – and if you want to continue this kind of work, then we maintain that, as a yoga and meditation teacher, you need more than just a short theoretical education. Not until a person has gone through a comprehensive individual training for several years, can one be certain that a teacher will possess a solid knowledge of him- or herself and of the effects of yoga and meditation so that one can be instrumental in bringing about a personal development of consciousness in other people. The Scandinavian Yoga and Meditation School was founded in Copenhagen in 1970 by Swami Janakananda. He had just returned from a prolonged stay with Swami Satyananda in Bihar, India, where he had learnt the deep reaching Tantric meditations, such as Kriya Yoga, Antar Mauna, Yoga Nidra, Ajapa Japa, Prana Vidya, Chid Akash and others. A yoga which, at that time, could not be learnt in Denmark, or in Europe for that matter. In the years to follow, the school developed quickly. From one small yoga room in an apartment, to a villa, and when that also became too small, to a larger building in the center of Copenhagen in 1975. Through the years, the school has grown and today it is an active center for yoga and meditation, with five yoga-rooms on two storeys and a shop. The need arose early on for a place in the country, to have intensive retreats such as the annual 3-Month Sadhana Retreat and the 10 and 14 days retreats around the year. In 1972, in Håå, south Sweden, about 150 km north of Copenhagen, the retreat center was founded. The Håå International Retreat Center has since been continuously improved and tailored to meet with the conditions that our courses demand to give the best possible conditions to the people that come, not only from Scandinavia, but from all over Europe, USA, Australia, New Zealand, Singapore and South America. In the following years, many schools sprung up around Northern Europe and Germany, and in order to co-ordinate the yoga teacher education and the teachings, the Håå Retreat Center also became a meeting place for the teachers of these different schools. Several times a year, they meet for meditation, seminars and collective planning. First of all, one’s own experience with yoga and meditation. The living and direct communication between teacher and student. The instructions of the classical yoga literature. The scientific research on yoga. Since 1983, comprehensive research has been carried out at The University Clinic in Cologne, in collaboration with Thomas Schmidt M. D. (see the article The Source of Energy). Dr. Thomas Schmidt also led one of the two research teams which, from 1987-92, tested the participants of the 3-Month Sadhana Retreat. This research was especially directed towards the blood composition of fats, hormones etc. Some of the results have already been presented at medical congresses abroad, and some are not concluded but still under analysis. Concerning yoga, Dr. Schmidt has also studied the effects of nose cleansing on the general health. Dr Schmidt’s research at The Retreat Center at Haa was complemented by a second research team lead by his Danish colleague, neuropsychologist Erik Hoffmann. Read about this research in the article Lasting and deep-reaching effects. Today, people use yoga for different reasons. Many have discovered that yoga can remedy back problems, allergies, stress or sleeplessness. Others do not have such problems, but do yoga because they have felt how the ability to concentrate improves considerably. However, this does not only concern healing or the ability to function – yoga and especially meditation have so much more to offer. The attitude of Tantric yoga is that human beings are fundamentally healthy. One who comes to a course is regarded as a unique individual with his/her own background and outlook on life – not as a patient, or one who should be persuaded of this or that. Although, through yoga you can indeed cure or alleviate certain diseases, yoga is more than esoteric gymnastics for cure and beauty. The actual perspectives are wider: To come nearer the essence of life. The picture in this article (and the ones mentioned below are from from Mithila, an area in Bihar in India, where, particularly, the women decorate the walls of the houses. These kind of pictures are not superficial ornaments. 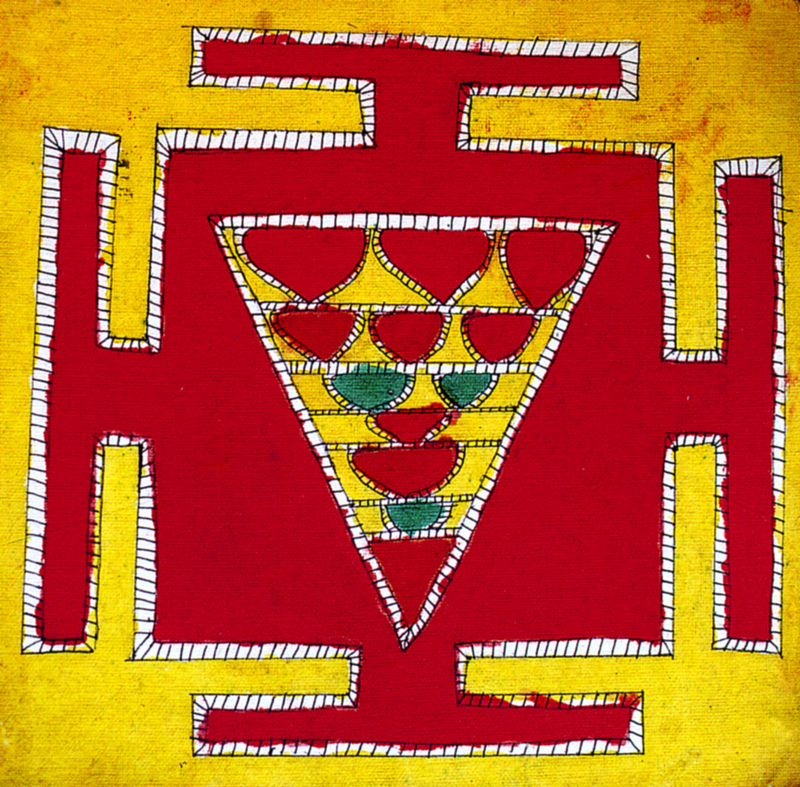 They originate in the strong source of folk art, where also, in ancient times, the tantric yantras have their origin. Collectively, this art is called Madhubani after a town in the area. The last picture in the article Kriya Yoga II is called, Shri Vijaya Pujan Yantram (awakening the victorious power); in this editorial you find, Shri Bhaum Pujan Yantram (for fertility, in folk art or spiritual power, in tantra); on the back of the cover, and as the third picture in Kriya II, Shri Ganapateshavari Yantram (Ganesha Yantra). The pictures belong to Swami Janakananda.